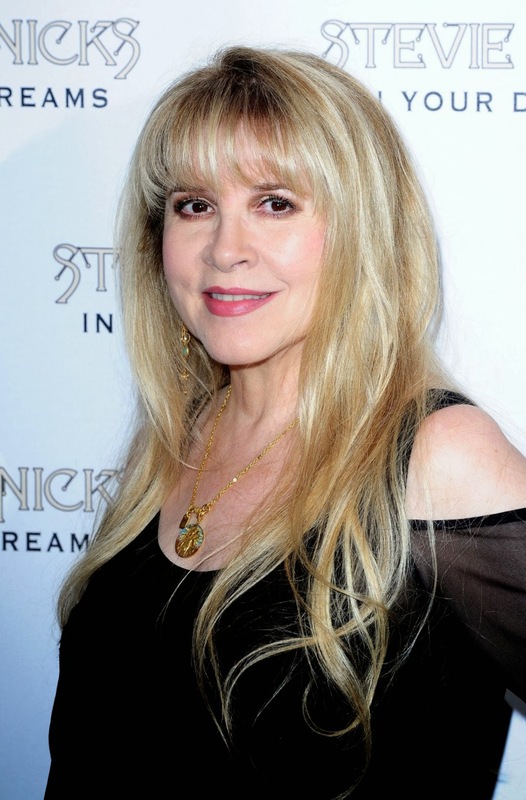 Stand back, because Stevie Nicks has a whole lot to tell Us Weekly! Just before her much-anticipated episode of American Horror Story: Coven airs on FX Wednesday, Jan. 8, the legendary "Gypsy" singer, 65, spoke with Us' Entertainment Director Ian Drew for an extended chit-chat about her acting debut, her lifelong connection with witches, a bumpy, hilarious jet flight with Kathy Bates, why she hopes her friends Katy Perry and John Mayer make it as a couple -- and Nicks' own talked-about romantic history, including a lesser-known relationship with The Eagle's Don Henley. Read the full interview with Nicks now! Us: Were you a fan of AHS before? How'd you get involved? Us: What'd you think once you watched a few episodes? SN: I was like, 'Oh my God! I had no idea.' Everybody in it is frightening. Especially Kathy Bates. I never want to run into her ever. And, geez, I hope I made the right decision on this. Because I've never even seen a horror movie. Never, in my life. I was a little freaked out. By the time we got to the end of episode two, I said, 'I'm in.' I totally get it. I'm seeing this as a fairy tale. These witches are misfits, the Glee kids are misfits. I totally understand this and the relationship between my music and Misty. Us: So how did you end up actually shooting a cameo role? SN: I had five weeks off. So I said, 'You know what? I wanna be on the show. I just want to walk through the house in a long black dress and look stunningly beautiful and say, 'Witches! I'm here!' and goodbye, and then walk down a long hall and out a back door.' When I arrived in New Orleans to film, the script was waiting for us, and my assistant read it to me and I'm like, 'They do know that I'm not an actress, right?' I was really nervous. But you walk into their world –- they built that house in the middle of a big soundstage, but they had an architect who spent six weeks, 24 hours a day building that house. It is a real house with bedrooms and plumbing and a kitchen. It all works! Us: Tell Us about the filming process. SN: I was there for two days. These people work a lot harder than me. They work 16-hour days. They work until they're done. I got there at 10 and we didn't leave until late, and they asked me to stay another day. Very magical experience; I got to really watch Jessica Lange work. I've never gotten to watch a really great actress be a great actress. They had to film me from every side. I said, 'Are you insane? I've never done this!' I got to meet everybody, too. Emma Roberts, Lily Rabe, Jessica. I didn't get to meet Angela Bassett -- she's so amazing! -- but I will, I'm sure. And I didn't get to meet Kathy Bates, because I didn't do a scene with her. But then the second day she came down to watch and we were leaving, so we took Kathy Bates and her sister on our little 7-person plane back. We seriously got to know Kathy Bates, because we had a long, very turbulent trip back. She is one funny woman! We were bumping around in the sky thinking we were never gonna make it. So it was quite a trip. When I'm very old, I will remember this until the day I die. I had a blast doing it! Us: Any more acting for you in the future? SN: I don't know of anything that will ever come along that will be this cool. I'm not an actress. This was a perfect fit for me. I'd have to be super interested in it, like I was in this. I'm totally into fairytales. I'm into the supernatural. I'm not as much into normal. If someone wanted me to be the mom or grandmother next door, I don't know that I'd want to do that. Us: What about the long-rumored-about biopic of your life? SN: That's not going to happen, because I don't want it to happen. I don't want a movie about me until I'm very, very old -- when I'm very, very old, everybody that wants to play me will be middle-aged. It's up to me to decide. It's the same thing with a book: Everybody wants me to write a book. I'm not. Because I wouldn't write a book unless I could really tell the truth, and say all the people are in it are represented right. Did I go out with Don Henley? Yes, but I won't change his name to Bob. If Don is in it, Don is going to be Don. If I'm gonna talk about all the people in my life, I need to be old enough and so do they that nobody's gonna care. Don's wife is not gonna care, and Lindsay Buckingham's wife is not gonna care, and all the men that I went out with in my life, their wives are not gonna care. I want to tell the real story of what happened with all these people, and why they didn't work out, and why I'm not married to one of them. I want to be truthful. I would never write a book about the bad parts. I would gently touch on them. I would mostly revel in the fantastic parts, of which there were so many. Us: You dedicated "Landslide" to Katy Perry and John Mayer during a recent Fleetwood Mac concert in Las Vegas. How did you become friends with them? SN: I like Katy's songs and her energy. I dance to them and I treadmill to them. Anybody who makes my treadmill list is my friend because they are helping me to keep my weight exactly where I want it to be. When I listen to that music I get very involved with it. I think Katy's really fun, funny and quirky. I met her in London months ago. We sat down at 11:30 at night. We sat in the coffee shop for three hours. We ran the gamut of her life, my life and everything. I just really like her. And I have been friends with John Mayer for a long time. I think John Mayer is one of the finest songwriters ever. He is right up there with James Taylor, Don Henley and those people. I really love him and respect him for those beautiful songs. So I just saw them on December 30 in Vegas, and that's where I dedicated "Landslide" to them. They seem to be a really great couple, and they seem to really care about each other. I am just hoping for the best for them. It would be great if that relationship really worked out and they were together forever. I think they're really good for each other. They're very different people, and that's the best way to go out with somebody. I always love to dedicate "Landslide" to people I know really get it and appreciate it. Because it doesn't go out to anybody. Us: Your Fleetwood Mac bandmate John McVie was recently diagnosed with cancer. How is he doing? SN: He's good. He's got his treatment, and now he did a show on the 30th and 31st, another tomorrow night, then he has surgery next week. He's good. He's gonna be fine. I'm not the least bit worried about John. He's very, very strong and a man of very few words. He's not a person to mess with. In advance of tonight’s Stevie Nicks party on American Horror Story — accurately titled “The Magical Delights of Stevie Nicks” — Vulture was granted a quick chat with the fairy godmother of rock-wedding officiator to talk about her acting debut. You already know she sings two songs; the obvious one is spoiled below. Selfishly, though, we wanted to hear about twirling dos and don’ts and the history of her shawl obsession first. There are other places on the Internet to go if you really want to ruin the how and why of Nicks's involvement with the coven — suffice it to say, she and Fiona are thick as thieves. Because of course they are! What’s the secret to doing a good twirl? Taking lots of ballet lessons. Very good publicity for Stevie!!!! I can't wait to see her in tonight's Coven, although I'm slightly disappointed at the song choices. I won't spoil for anyone who doesn't know, but I was really, really hoping she'd pull out a rarely performed selection or something she hasn't done in many, many years. An occasion such as this would have been the perfect opportunity. Oh well, she does have another appearance in the season finale so perhaps there's another performance on the way. It's cute how some of her dialogue are the lyrics to her songs. Danced across the stages of the world.....sweet girl.